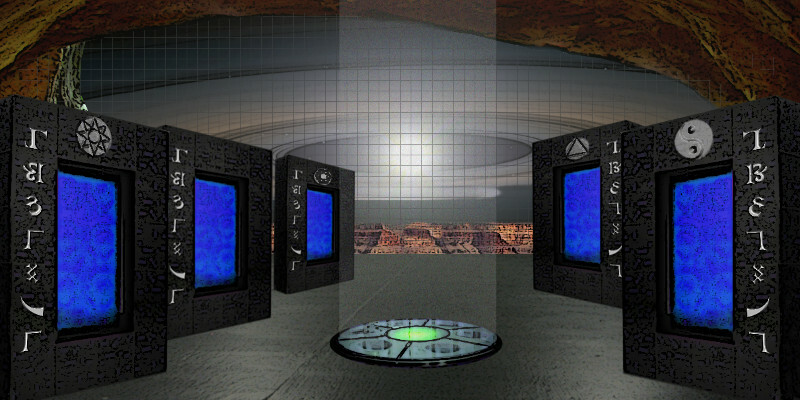 The Stonehenge Portal Room is an advanced place and an advanced state of being. Your journey through the Tree of Life has been glorious. All along the way you have transformed, removed, added, tweaked, examined, and tested a new self. You may not realize it but these energies in each of the Tree of Life tarot locations has changed you, subtly, into a brand new self. But these changes happened slowly and you may not even be aware of who you are now and who you were, who you will become. Here in the Stonehenge Portal Room, you can examine your self and get an idea of what was, will be, and needs to be. Note: this place is located under the Stonehenge Stones at Stonehenge Campground. Both locations need to be visited to complete the quest objectives at the Fool tarot card location. There is a staircase (not shown) in the Portal Room that will lead you up to the other part. This place is a personal place. It is not about the little things in your reality. I will go on to say it is not about the big things in your reality. It is about the only thing that matters. Your transformation from human to divine being. This whole trip through the Tree of Life has had that singular purpose. Oh sure you can use these various locations for other things in your world, but the real reason to go to these places is so you can touch the archetype energies that will/are transforming you. The Stonehenge Portal Room is located between Kether and Binah in the Tree of Life. 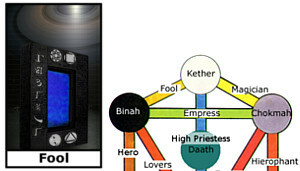 The transformation energies of Binah combine with the spiritual energy of Kether to form this place of inner exploration. Here you discover your Soul and what makes your Soul unique in itself. The Fool is a powerful state of being. You have collected all the tarot energies and remade yourself into something new. Your reality is starting to change to reflect this new self. You have become the Fool. The state of the Fool is one of being immortal and indestructible. The Fool is ready for the next adventure (beyond human) of which he has no preconceived notions, so he cannot trip over his own belief system. However the state of the Fool is not static. If the Fool fails to act his reality closes up. So he must act and move from the state of the Fool, into the next state of being, whatever that may be. It is a temporary state of being where anything and everything is possible. There are 5 portals or doorways here. Each one will explore a different aspect of yourself. 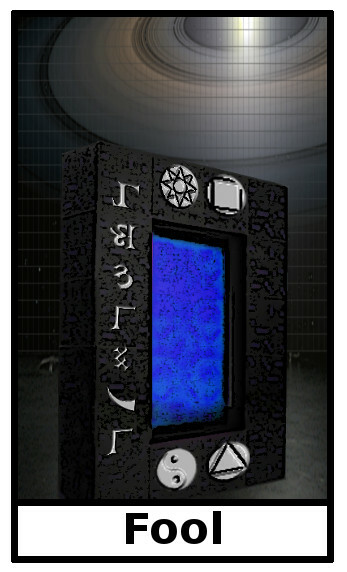 Portal of Tomorrow (octagram, left front): Here you will meet your future. The person you will become. Here you will see what all the hard work you have been doing will lead to. See who you become and why you choose to become this person. Portal of Today (square, left middle): See how you are now, what drives you forward, holds you back still and what are the things that are important to you. Portal of Probabilities (hexagon, left back): Here you can see all the paths not taken in your past and explore the probable choices for your present reality. Portal of Yesterday (triangle, right back): See who you were and what made you then. How that person used to see the world. You may not realize it but that person saw the world very differently from how you see it now. Portal of Soul (yin-yang, right front): This is the most important doorway of all. It is you without your human world, without your attachments, distractions, and all the things that keep you from knowing the only true self there ever was or will be. Your Immortal Soul! Adventures in this place may take time to understand as you are dealing with an advanced part of yourself. The being you are becoming, the being that you already are, the being that was always you. Why are these things important? Well the next step is across the Abyss and into Kether, a place of pure spirit. It is a place where all the human things you thought mattered actually do not. But you are not there yet. This place prepares you for your Kether experience, where you will become Spirit and be Spirit. The Portal of Soul begins a process that you will continue in Kether, the merging of your human self with your divine Soul. The one time gift here is a huge increase in your spiritual vibration. This boost in vibration will not only help you enter Kether but also give you a lot more mileage in your ability to steer your life. You obtain this gift by entering the transporter in the center of the room and momentarily beaming yourself into the Kether-Pulsar to bathe you in its mystical light. Possible spirit guides you can meet: will list them as we get them.